How will central banks react to the large correction of bond and stock markets that seems to be under way now? My guess is that they probably like what they see because valuations had lost touch with common sense, corporate earnings and realistic inflation expectations (in the case of bonds). In the U.S. and the euro area, economies are doing so well that even if prices fall by 20 or 30 percent from their late-January peaks neither the Fed nor the ECB will get nervous – yet. The decline would just be a normalization and thus welcome. If history is a guide (see the following table), stock indices could well fall by more, though, because the starting point had been so extremely high. The question is therefore whether the recent sell-off is the beginning of something big. Bonds are better protected against a crash because the upside potential of policy and money market rates – which are their main drivers – is limited in this low-inflation environment. If stock markets fall by more than those 20 or 30 percent, the Fed will slow or give up its policy of gradual rate increases while the ECB will probably extend the asset purchasing program beyond its preliminary end in September. Market participants can be confident that Mario Draghi will once again do everything it takes to stabilize the economy of the euro area. Call it the “Draghi put”. He keeps saying that the fight for higher inflation has not been won. The strong euro and a coming sell-out of bonds and stocks have deflationary effects which makes his task quite challenging. Monetary policies will remain very accommodative in Europe. For more than two years, the Fed has raised the funds rate, but it is still only at 1.42% and thus below both core and headline inflation. No wonder that market participants were, until quite recently, unconcerned about monetary policy. This has changed. The Fed had stopped its asset purchases in response to a robust labor market and a rebound of inflation in the fall of 2014 already, but it was not before the middle of 2016 that 10-year Treasury yields finally bottomed. Since then they have climbed from 1.35 to a recent high of 2.85%. The 35-year bond market rally had finally come to an end. Moreover, the so-called FOMC dot chart, regularly produced and published by the Governors, shows that the majority at the Fed expects the policy rate to rise to 3.1% by the end of 2020. Not much actually, but well above expected inflation and thus not something that could be ignored any longer. Equity aficionados had to take notice. Since bond prices had declined, both in absolute terms and relative to equities, stocks began to look increasingly expensive. Incidentally, rising interest rates have another adverse effect on stock prices: in finance theory these are the present values of companies’ expected future cash payments to the owners. If the discount rate used in these calculations goes up, present values fall, along with stock prices. Finally, equity valuations. They have raced ahead of earnings. 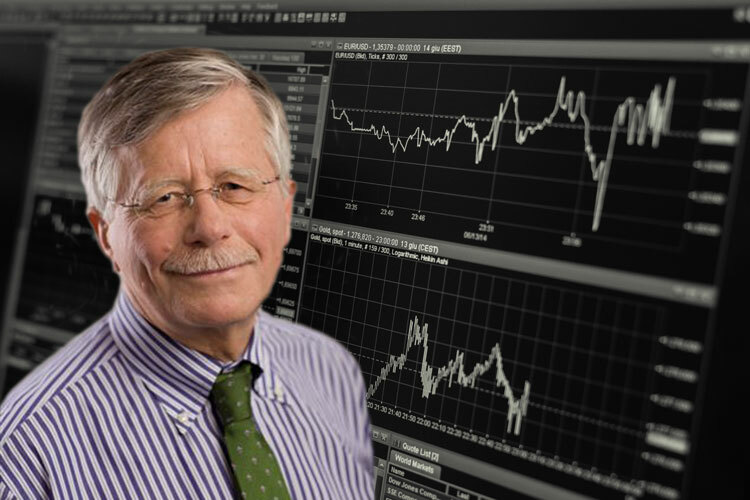 Even today, well into the price correction, the price-earnings ratio of the S&P 500 is 21.9 and thus way above the long-term average of 14½, as calculated by Yale University’s Robert Shiller. No doubt, economies around the world are doing fine and may expand briskly for the foreseeable future. Corporate profits will therefore probably rise, but can they really increase by another 26.4 percent this year, analysts’ consensus forecast on Bloomberg? In other words, the chips had fallen into place for a stock market sell-off. No one can be surprised. According to the most recent forecast of the IMF, U.S. real GDP will rise by 2.7 and 2.5 percent in 2018 and 2019. Combined with average inflation rates of about 2 percent it seemed likely – at least until last week – that nominal GDP would increase at a rather steady rate of 4½ to 5 percent. Nominal GDP growth often serves as a proxy for “normal” short term rates. Going by this yardstick, the Fed funds rate could rise considerably more than expected by the Governors. At 1.5 percent year-on-year, U.S. core (PCE) inflation is still well below the central bank’s 2 percent target, but cost pressures are clearly intensifying: hourly earnings are up 2.9 percent, import prices by 3.0 percent, and producer prices by 3.3 percent. While capacity reserves are probably still large, as suggested by the following graph, they have begun to shrink – it has become easier to pass those higher costs on to consumers. The United States has not yet achieved full employment, in spite of an average 1.6% y/y increase of employment over the past eight years, and in spite of the steep decline of the unemployment rate to 4.1 percent. Such a level had been considered unattainably low not long ago. The problem is the labor force participation rate. It is still depressed as at least 7 million potential workers have decided not to look for jobs, probably because they do not find anything attractive at this point. This “reserve army” reduces the risk that wage inflation will get out of control any time soon. It can therefore be expected that the Fed will continue to proceed cautiously, but proceed it will, unless hell breaks loose on stock markets. If it sticks to its policy of a maximum of four 25- basis point increases per year, “normalization” will be achieved only in spring 2021, more than three years from now. By that time the economic expansion would be twelve years old and thus the longest in US post-war history. The following graph shows that monetary policies are still very expansionary. The weak dollar is another reason for a further, and perhaps even an accelerated tightening of U.S. monetary policies. 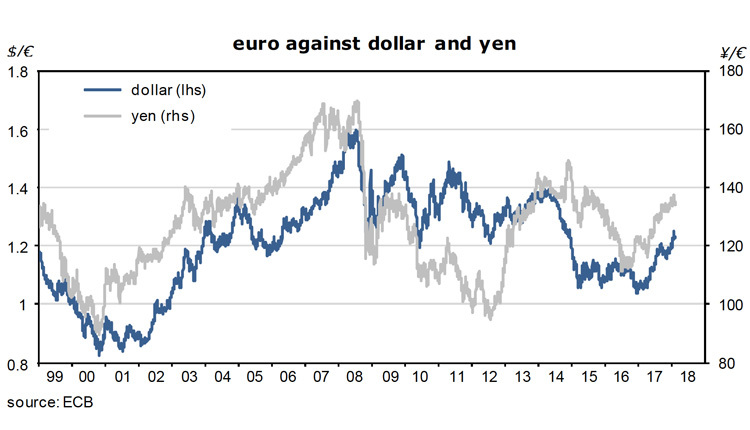 Since early 2017, when the depreciation began, the trade-weighted dollar index has lost about 10½ percent, and no less than 16½ percent bilaterally against the euro, the currency of its main global competitor. In other words, the price competitiveness of US business has improved a lot – which has made business increasingly shock resistant. At the same time, the weak exchange rate means that the country imports inflation. Given the large and steady supply of dollars on FX markets as a result of the 450 billion current account deficit the depreciation of the dollar has probably not yet run its course. In purchasing power terms it is still considerably overvalued. 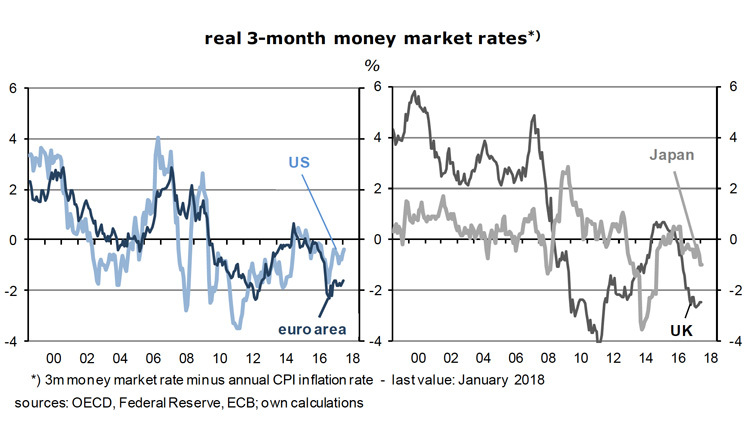 On the basis of 1-year money market rates, the dollar will lose 2½ percent against the euro between now and February 2019, and about 2 percent a year on average for the next ten years if one goes by the current 207 basis point difference in 10y government bond yields, or the 172 basis point difference in 10y swap rates. A warning: futures markets (which reflect interest rate differentials) are not very reliable predictors of future spot exchange rates – they just represent an arbitrage equilibrium. How about the euro? The present economic expansion of the euro area is just a little more than three years old and thus much shorter than America’s. There had been a 3-year recession and stagnation, from August 2011 to August 2014, caused by the government debt crisis and austerity policies in the region’s peripheral countries. Since then industrial output has increased at a brisk average rate of 3.4 percent but is still a little more than 2 percent below the peak reached in January 2008, ten years ago. There must be a lot of slack. This is confirmed by labor market data. Even though employment has been up at an annual average of 1.2 percent since its low point in Q2 2013, it is presently only marginally higher than in 2008 and thus far below the long-term trend line. But there is reason for some optimism: over the past year, jobs growth has accelerated to 1.7 percent. And surveys suggest that business will continue to hire aggressively. Full employment remains a distant dream though, especially for male workers whose participation rate has fallen year after year to a decades-low of 63 percent, without any signs of an imminent turn-around. They apparently don’t like the precarious new jobs that are on offer. Women have come to the rescue, so to speak: they have entered the labor market in large numbers and have more than filled the gap left by the disappearing men. Overall, the participation rate has increased by 1.3 points, to 56.7, since the launch of the euro in January 1999. A more important source of additional workers and employment gains has been immigration from outside the euro area, though. The unemployment rate has fallen steadily from a high of 12.1 percent in 2013 to 8.7 percent last December. If such a pace is maintained in the future, it will take 6 ½ years to reach 4.1 percent – America’s present level. Workers are therefore in a weak negotiating position. The recent appreciation of the euro has not helped. Not surprisingly, therefore, that the most recent euro area compensation per hour worked has been up just 1.6 percent year-on-year. Since hourly labor productivity in the euro area economy as a whole continues to rise at rates of about 0.8 percent, unit labor costs are up by less than 1 percent. Subdued wage increases are the main factor that keeps consumer price inflation far below the ECB’s target of 1.8 or 1.9 percent. Core CPI inflation has been tied down at around 1 percent for four years. With euro area import and export prices likely to fall or stagnate from now on there are no signs on the wall pointing to an acceleration of inflation. Now that stock and bond markets have become increasingly volatile and may go into a nose dive, given their rich valuations, the ECB will be even less inclined to tighten policies. The Fed may continue to raise the funds rate, but the ECB will probably sit tight. Time and again Mario Draghi has emphasized that the Governing Council stood ready to extend the asset purchasing program beyond its scheduled end in September 2018. Against a background of vigorous economic growth and rising interest rates in the U.S., these statements had increasingly been dismissed as mere central banker speak in recent months, and several hawks on the board had actually begun to argue for ending the zero-interest-rate policy. The problem is that higher rates would cause havoc on capital and currency markets which are already quite nervous. No, the ECB’s default option is to wait and see. 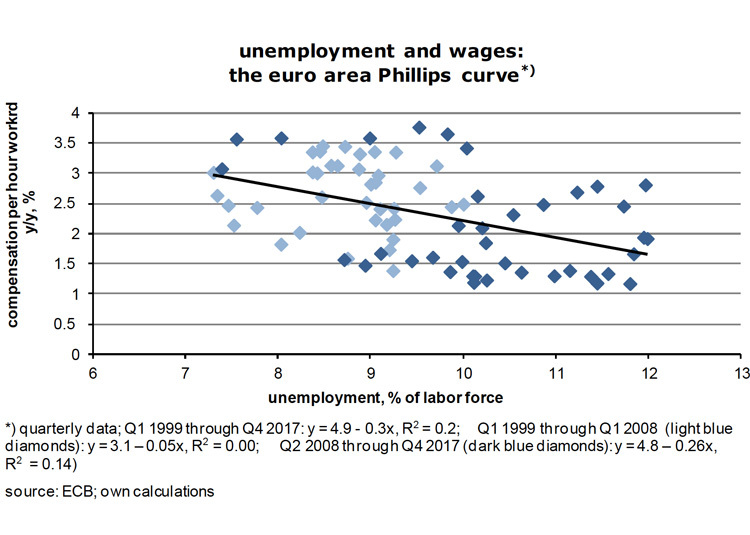 It seems that the trade-off between unemployment and wages – the so-called Philipps curve – is still alive and well in the euro area (see the following graph on the next page). As the situation on the labor market continues to improve it is reasonable to expect that wages, and therefore inflation, will eventually react, ie, rise at a faster rate. The majority on the ECB Council has been betting on this mechanism and believes there is no need to interfere. Interest rates must go up in the end, but not just now. The recent, in some ways sensational wage agreement between the IG Metall labor union and the German employers’ association is a confirmation that the Philipps curve correlation does indeed exist: thanks to the large depreciation of the euro, expansionary monetary policies and no further fiscal tightening (not least because of the large influx of refugees), Germany’s economy booms these days and has become the growth engine for the other countries of the euro area and the rest of Europe. Fourth quarter industrial production had been up 5.0 percent year-on-year, employment has been rising at rates close to 1½ percent for several years, and the unemployment rate has fallen to 3.6 percent (ILO-definition). Since the volume of incoming orders in the capital goods industry had risen at an annualized rate of no less than 19.4 percent over the past two quarters, while corporate profits could not be bigger, it did not need much arm twisting to negotiate hourly wage hikes of close to 4 percent for 2018 as well as for 2019. This compares to an inflation rate of 1.6 percent. The settlement is a bellwether for the entire German labor market. 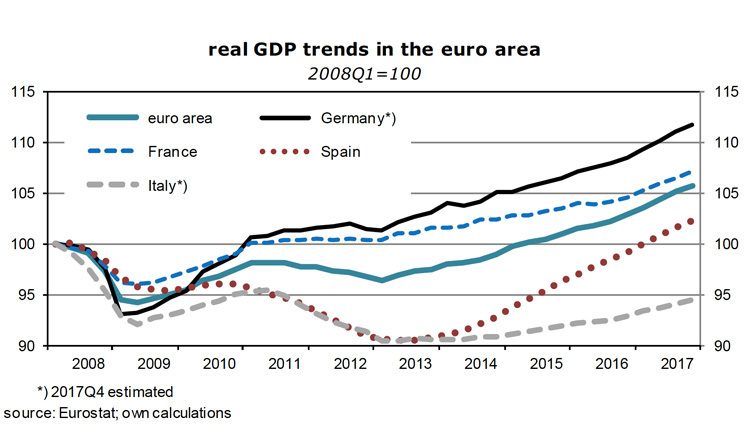 In a way, monetary policy has contributed significantly to the near-optimal results for the euro area. The strategy is called “financial repression”. In the short run, it is good for borrowers and bad for savers – and it is the right medicine to get an economy going again after a depression, a war or a long and deep recession. So far, there is little to complain about: inflation is low, growth is steady and in the order of 2 ½ percent, unemployment is on the way down, the number of jobs is rising briskly and the euro exchange rate is still quite favorable in terms of international price competitiveness. 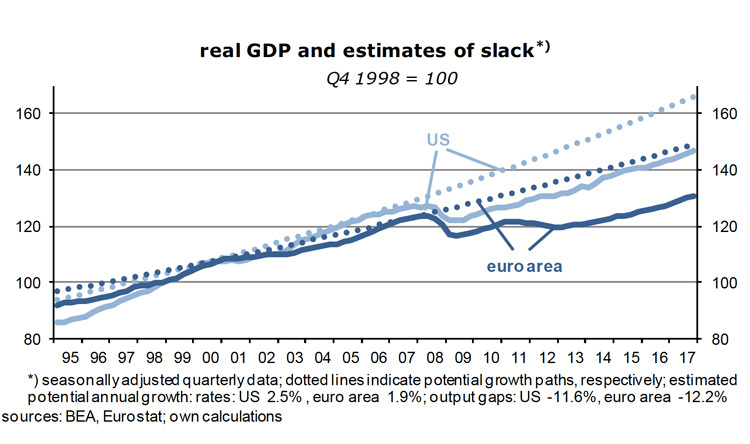 But not all is well in the euro area. No one can be sure about the risks that are still hidden in bank balance sheets, especially in Italy, but also in Germany and France – price-to-book ratios at some of the large banks of well below 1 suggest that investors are rather skeptical about their financial health. Non-performing loans are also seen as a major problem by the supervisory arm of the ECB which therefore urges lenders to do more to clean up their balance sheets. About €760bn of bad loans, 7.0 percent of all loans to the private sector, are weighing on euro area banks, according to the ECB’s Danièle Nouy at a press conference on February 6. The problems are particularly acute in Italy. In short, one reason the ECB wants to keep low interest rates is to alleviate the risk that non-performing loans materialize during a new slow-down of growth or a recession. Another is to further reduce the interest burden of governments. I therefore do not see why the ECB should start to raise interest rates in the near future, even if the Fed continues to do so. As long as inflation is not a risk, present policies are justified and can probably be extended into 2019. Incidentally, the asset purchasing programs of the ECB are – aside from maintaining low interest rates – another means to improve the debt sustainability of governments. Since the national central banks of the euro area are part of the respective country’s public sector, purchases by the Bundesbank or the Banca d’Italia of government bonds offset a part of the debt issued by the German or Italian governments. This is common practice among central banks. The Fed, for instance, holds about 12 percent of U.S. general government debt; the number for Japan is in the order of 35 percent. In the euro area the aggregated holdings are presently 17.7 percent (Germany 13.4 percent). Put differently: one part of the government has to pay interest on its debt, another part receives the identical amount as interest revenue. It’s a wash. 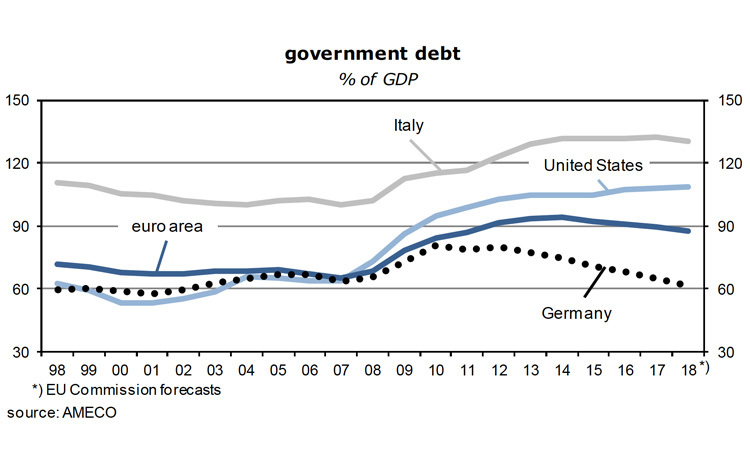 The maximum the national central banks of the euro area can buy is 33 percent of any debt issue. “The issuer limit of 33% is a means to safeguard market functioning and price formation as well as to mitigate the risk of the ECB becoming a dominant creditor of euro area governments.” (Link) For the time being at least these Public Sector Purchasing Programs (PSPP) have no serious drawbacks. Clearly, if they get too big, they will expose lawmakers to moral hazard risks. But from the perspective of taxpayers they are just wonderful – as long as they do not lead to unacceptably high inflation (which they don’t right now), ie, as long as people have trust in the value of the money they get from the printing press. If I am right about rising inflation rates in the U.S., caused by relatively high rates of capacity utilization and a weak dollar, it follows directly that the Funds rate will indeed be raised further in coming years. Together with rising inflation expectations this pushes up dollar bond yields. In three years’ time, the Funds rate might be at 3.5% while 10y Treasuries could yield 4.5%. Because this implies further declines of bond prices (about 15 percent in the 10-year range), financial investors are well advised to shorten the duration of their holdings. I do not yet see an inversion of the dollar yield curve. For this to happen, wages and consumer price inflation have to accelerate a lot. Only if consumer prices are perceived to be getting out of control will the Fed really step on the brakes. It’s not a likely scenario in the near term. What would be the effects of a 50 percent decline of the S&P 500 on bond markets? In case it triggers a new deleveraging, ie, debt reduction process, one should expect a recession plus a new round of downward pressures on consumer prices – which would make “safe” government bonds the assets of choice again. Bond yields would fall, and the Fed would go into reverse. This is not a low-probability outcome considering the still-stratospheric stock market valuations. Investors must keep this in mind. As to investments in the euro area, the decline of U.S. bond prices raises the relative price of euro-denominated bonds and thus pushes them down, to some extent at least. Between last December and today, the correlation has been very close, exceptionally close I would say: on both the Treasury and the Bund market, yields of 10y debt rose by 45 basis points. 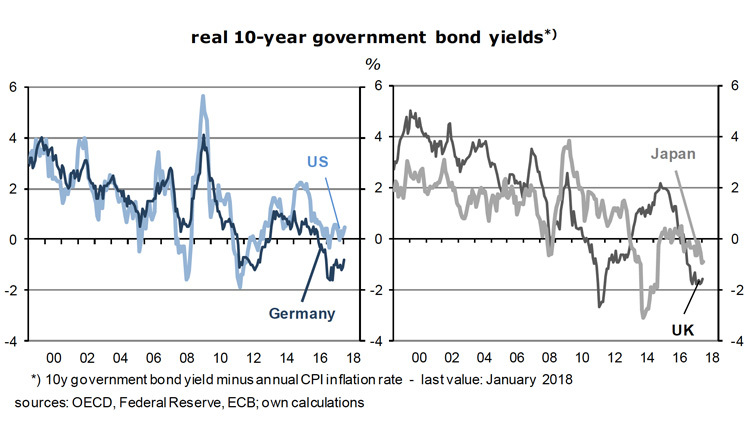 But the expectation that, for the various reasons discussed above, the ECB will not raise policy rates will limit the extent to which long euro yields can rise from here on. The difference between overnight rates and 10y Bunds is already an unusually large 117 basis points (-0.42% – 0.75%): so-called carry trades – where you fund short and invest long – get increasingly attractive. We are approaching a point where any further weakness of U.S. Treasuries will not affect the Bund market much more, where it is not too risky any longer to hold long-maturity euro-denominated bonds. How about yield spreads between the government bond markets of the euro area? The star performer has been Greece – 10y yields have come down 380 basis points, to 3.72%, since February 2017 -, followed by Portugal (-208 bp). Even Italy and Spain have done quite well. All this reflects the improvement of investor sentiment concerning the risk of new sovereign debt crises. It’s the ECB and its “whatever it takes” promise! Compared to the euphoria in the years before the Great Financial Crisis, investors remain cautious. Spreads are still fairly wide. One alternative to 10y Bunds are, for instance, French government bonds. If France cannot service its debt this would be the end of the euro. It will not happen. Its carry trade spread is an attractive 143 bp and thus a lot larger than Germany’s. A similar argument holds for Spain (186 bp), but also for Italy (230 bp). These countries are much too big to fail. Look at Italy again after the national election on March 3: none of the leading parties proposes to give up the euro anymore. If this is confirmed, Italian bonds will do well. 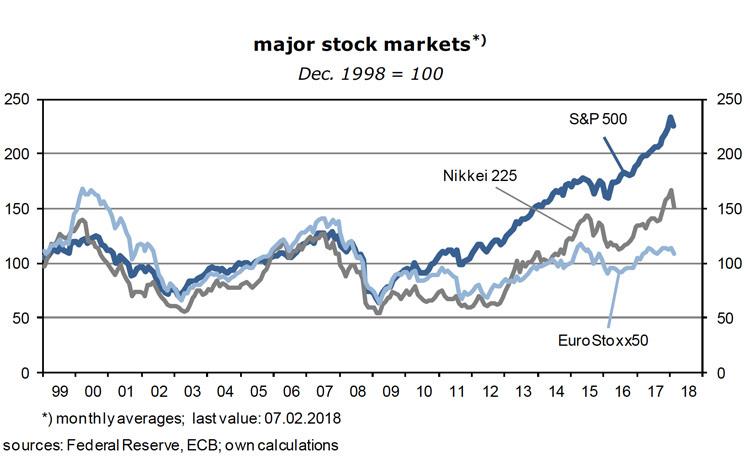 A strategy that follows from my arguments above is that higher-yielding euro area government (and perhaps bank bonds) might be used as hedges against the not-so-unlikely sell-off of stock markets around the globe. For investors whose base currency is not the euro, the question is how differences in monetary policies will affect the euro-dollar exchange rate. The dollar tends to strengthen as the Fed raises interest rates while the ECB does not. But interest rates are just one determinant of exchange rates. 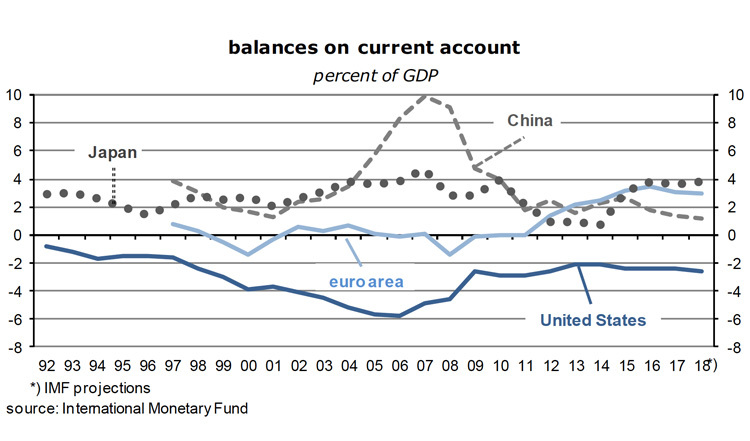 Of the others, real GDP growth rates are broadly similar, the euro balance on current account is in surplus while America’s shows a large deficit (see the following graph), the same holds for government budget deficits, and a simple comparison of the purchasing power of euro and dollar suggests that the former has a catch-up potential to at least $1.35. In other words, the euro looks cheap and the risks of an outright exposure to euro assets appears modest. But, of course, the best protection against FX risk is to do the funding in euro.